What a fantastic day selling. Every now and then you come across something that is a unique and high quality product. I remember back to the days I was in the butcher shop and we began carrying the Rocky the Range chickens. At the time, probably around 1987 or 1988 when we began carrying them they were the first commercially available free range chicken. Today I rode with Debora Feron-Sanchez from Bay Brokerage and David Taylor from Eddy Packing the processor of Heartland brand Akaushi Beef. Akaushi Beef is a breed of cattle from Japan that were moved here in 1994. The cattle are unique in the fact that they are low in saturated fat and high in mono-unsaturated fat. They also have a high level of Conjugated Linoleic Acid, the most aggressive anti-carcinogens ever discovered. As we opened packages and viewed the product we found the meat to be extremely well marbled. In fact the beef regularly grades several times higher than prime. In the Japanese grading system it is a consistent grade 7. Feeling the raw product was interesting as the tenderness was apparent when you held it. At the Beach and Tennis Club with Chef Benjamin Brown we sampled the raw product and then prepared it grilled on the char-broiler to rare. The flavor of the 6 oz tenderloins both ways was amazing. The tenderloin is usually found to be the most tender cut, but the beefy flavor of this product was incredible. Personally, I have never had such a favorable filet. While we had fun all day cutting this product, it was really funny when one of the chefs realized that the well marbled Ribeye he thought he was looking at was identified as a strip loin. Pat Ottone, the owner of Lallapalooza and the new LallaGrill cooked up an Akaushi Ribeye and was very impressed. Look to see a $100 steak added to the LallaGrill in the near future. Today Jim Crane was supposed to be riding along on the Central Coast, however schedules did not mesh and instead he is up in the North Bay, probably up in Silicon Valley staring at office buildings instead of ocean, Golf courses, and valleys. It wasn't Jim's fault that he couldn't be here, honestly it was mine. We had a third party booking the schedules for this week and he gave me a deadline to list accounts, contacts, and products but there was no way I could meet while managing the Att Pebble Beach Golf event. It is unfortunate that we won't have a chance to compare products today, and I had so many questions too. First, I was looking to compare the Kurobuta Pork with Salmon Creek. I've seen Salmon Creek popping up on menus with more and more frequency. 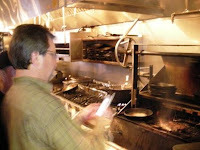 But even this week in talking product with Curt at Willy's Smokehouse, his preferences was for Kurobuta Berkshire pork. Kurobuta Pork is the most flavorful, succulent and consistently delicious pork available. Grown naturally from 100% Berkshire hogs, known in Japan as Kurobuta or "Black Hog", they are fed longer for slower growth that results in finer muscle texture, fine abundant marbling and a deep, rich meat color. Kurobuta Pork is exquisitely tender, consistently juicy and tremendously falvorful. Snake River Farms is one of the few brands offering 100% purebred Berkshire, ensuring a consistently exquisite eating experience. Salmon Creek Farms Natural Pork is produced by Independent Meat Company in Twin Falls, Idaho. The maker of Falls Brand meats since 1904, Independent Meat Company has established a long-standing reputation of producing high-quality products. Salmon Creek Farms Natural Pork is a partnership of family farmers and a family-owned processor united to produce the best natural pork in the world. Salmon Creek Farms Natural Pork is produced the way nature intended, without artificial enhancers, preservatives, chemicals, or added moisture, and all records and management protocols are subject to third-party verification. Farmers also participate in and receive certification in the National Pork Board’s Swine Welfare Assurance Program. No other natural pork program combines wholesomeness, quality, and animal care with science, management, breeding stock, selected grain feeding, and production efficiency as well as Salmon Creek Farms. I read about a premium line of deli products from Snake River Farms. I was looking forward to learning the features, advantages, and benefits of the products. I have several customer that have jumped on the casino roast band wagon in the past couple years. Some are using raw, others cooked. I have seen it spec'd as a prime CAB product that I would have liked to see cut against a SRF Kobe Casino roast. How would you like that for a deli sandwich at your upscale deli? Finally I am really hungry for more braised pork belly dishes. I don't think you have lived until you have had a braised kurobuta pork belly. 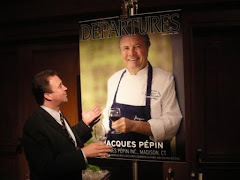 I hope to reschedule with Jim for the next trip he makes out to California. Next time we need to eliminate the middle man so I can book him for a day or two on the Central Coast! On Tuesday February 19th Brian Isaeff and Mike Salas hit the bricks with 3 new items to show off. Mike formerly of SMS Seafood the seafood procurement division of Alliant is now with Empress Ltd Seafood. Mike's ability to source and secure location specific, custom value added, and natural products is his strong point. Last year Mike was able to secure a clean, origin pacific shrimp for the Pebble Beach Company. On this trip Mike had a "Shrimp topper", a pre-skewered 41-50 count Shrimp-split and skewered. This item runs roughly 35-40 cents each and comes packed about 44 skewer per 2Lb bag, 5 bags per case. Two frozen tuna items were big hits. Both items are by-products of South Pacific Ahi Tuna. They were both treated with a tasteless wood smoke and then cryogenically frozen. Previously, putting sushi-grade tuna into the freezer was tantamount to throwing it away. Once the translucent red flesh hits standard freezing temperatures (minus 10 degrees F), it quickly turns to a less-appealing chocolate brown. Because oxidation darkens its color in only a matter of hours, getting tuna to the market fresh has always been a battle against the clock. The solution combines old and new technologies. Take wood-smoke processing and filter it with state-of-the-art equipment, and you have “tasteless smoke.” The filtered wood smoke penetrates the fish without imparting a smoky odor or taste, while preserving its color, flavor, texture and, most importantly, its value. The first item was a tuna scape. Scrape is perfect for teka maki, smoking, salads, stir fry's and more. Running roughly $3.00 per pound this is a versatile by product. 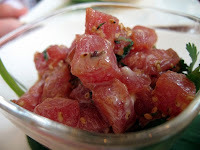 The second item called Crazy Cuts run about $3.50 per pound and can be used in any small chunked tuna recipes. The feedback from customers was all positive, with special orders being placed as we traveled. Poblano is a mild chile pepper, just slightly more spicy than a bell pepper . One of the most popular peppers grown in Mexico, the plant (of the "annuum" species) is multi-stemmed, and can reach 25 inches in height. The pod itself is about three to six inches long, and about two to three inches wide. 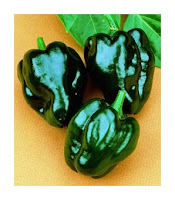 An immature poblano is dark green in color, but eventually turns a red so dark as to be nearly black. When dried, this pepper becomes a broad, flat, heart-shaped pod called an Ancho chile, often ground into a powder used for flavoring recipes. Ancho is the sweetest of the dried chilies. It has a mild fruity (paprika) flavor. They are fairly mild, ranging from 1,000 to 1,500 Scoville Units. Dried Ancho has a dark, brick red to mahogany color and ranges from 3 to 5 on a heat scale of 1 to 10. 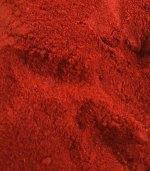 Ancho powder is made from grinding whole Anchos, seeds and pod both. Ancho Chile (chili) is a dark smokey chile with a deep rich flavor and mild to medium heat. This pepper is the most commonly used in authentic Mexican cooking. The northwest coast of Sutherland is at the very tip of Britain's mainland. The Loch Duart rearing operations are based at Scourie - a centre of Scottish salmon production for hundreds of years, where salmon rearing is now the prime occupation and skills are handed down from generation to generation. Badcall Bay is just off the coast road sout of Scourie and the Badcall Salmon House resting at the water's edge. Built in the 19th Century, Badcall Salmon House is the headquarters of Loch Duart Ltd and the nerve centre of their operation. They are taking further steps to protect the environment with a pioneering integrated aquaculture initiative which involves growing sea urchins and seaweed alongside their Freedom Food salmon. Sea urchins live comfortably alongside their fish, feeding on leftover fish food and cleaning algae off the sides of the pens. The variety of sea urchin being grown by Loch Duart is a native species called Paracentrotus lividus and is a much-prized delicacy. Seaweed feeds on the nutrients that even the most sustainable salmon farming may add to sea lochs. The glory of integrated aquaculture is 'nutrient balancing', which is missing from most monoculture. Two types of indigenous seaweed are being grown at Loch Duart - Palmaria palmate (Dulse), often described as 'a vegetarian oyster' and Laminaria saccharina (Sugar Kelp). Both varieties are a delicious source of important minerals. 'Balancing' means removing at least as much nitrogen and phosphates as are put in by the salmon farm. In this way, we will be able to demonstrate that the farm has a neutral or even positive environmental impact. One of the benefits of the seaweed growth is carbon sequestration. Loch Duart is now looking to capitalise on new opportunities in sustainable aquaculture, such as commercial production of sea urchins – which are considered a delicacy in European markets – and seaweed for the cosmetics industry. In 1980, only 9% of the fish consumed came from aquaculture, now it is 43%. The salmon farming industry is an important contributor to the Scottish economy, providing 8,500 full and part-time jobs, often in remote locations and contributing more than £197m into the Scottish economy. Scotland exported more than 12 million salmon to 60 countries and is the third-largest salmon producer in the world with a 10% global market share. In the cold clear waters of Scotland’s rugged coast, the artisan salmon stewards of Loch Duart have been using safe, sustainable practices for years to produce salmon as salmon should be: vigorous, shiny, firm, and flavorful. In the strong tides and severe winds of this region of natural salmon migration, the conditions are perfect for rearing salmon consistently judged superior in taste, quality, color and appearance. As a member of the CleanFish Alliance, Loch Duart is a true artisan producer utilizing traditional practices to ensure quality salmon for years to come. Loch Duart is a very different Salmon Company. The difference begins with their approach to rearing salmon and ends with a product which is consistently judged superior in taste, quality, color and overall perception, as evidenced by the number of leading international chefs and restaurants which service Loch Duart farmed salmon by name. 'Best practice' is the principle applied to Loch Duart salmon at every stage of rearing, harvesting and supply - a sustainable and environmentally-responsible approach. Cut off for next delivery is 11:00am EST. 25# minimum, can be combined with other items from the same region. Contact Brian for more info or to order. Prices quoted will include all shipping charges from farm to you. The lettuce market is steady right now, but may dip further by weeks end. Demand is better then last week, but warmer weather has also left the shippers with an abundance of product. Shippers are offering a few deals this week so far than previous weeks. Current lettuce defects include cap discoloration, misshapen heads, ribbiness and epidermal peel. Shippers are trimming the defected leaves down and this is causing the color of the lettuce to be very pale. Florida is experiencing very good supplies with demand and supplies expected to being steady. Weights reported in the 38 – 44 lbs per case range. Mexican supplies of iceberg are steady. The leaf markets once again continue to have wide price ranges from all shippers. Supplies vary on each of the different leaf packs. Green leaf, red leaf, and butter are in better supplies now, but romaine supplies continue to lag behind demand. The weather is a bit warmer which is helping growth rates. The demand for romaine is increasing. The quality on Romaine out of Yuma is fair with blister/peel and weights in the 35 to 38 pound range. Growth has been helped by warmer weather. The demand for romaine is increasing, and still ahead of supply, resulting in higher markets. The quality on Romaine out of Yuma is fair with blister/peel and weights in the 35 to 38 pound range. Florida romaine market has continues to be very tight with some suppliers reporting being sold out. Supplies did improve this week, but enough to help with the gap. Weights are in the 38 – 42 lbs range. Very light supplies out of Mexico. The broccoli market continues with more favorable prices. Available supplies have better volume this week mainly due to warmer weather helping its growth. Coupled with slow demand the increased volume is bringing the market to lower levels. There are deals out there to try and kick-start demand. Demand for processed broccoli continues to be strong. There have been a few reports of quality issues showing some purple cast. Plenty of product is still coming out of Florida, and very heavy supplies available from Mexico right now. The cauliflower market is sliding lower also. Warmer weather has improved growth rates and looks to continue this week. Demand has weakened from previous levels. The overall supply of cauliflower has increased and the trend looks to continue. Prices still vary from shipper to shipper as their volumes change. Many shippers are offering deals to move product this week. The quality of cauliflower is good with some yellow cast and rough curds showing up. Weights range between 28 to 32 pounds. Carrots supplies have tightened up with the cold weather in California. Demand continues to be strong, spurring the market on. Quality and color of carrots are excellent. Georgia is still going strong. Quality and supplies are good and the market remains steady. Canadian carrots supplies have tightened up just a bit. Quality continues to be good. The celery market is stabilizing, and it looks to continue to do so for the rest of the week. The supply of larger sized celery is where many shippers are making deals to move excess volume. The supplies do vary form shipper to shipper. Demand is slowing down on celery and looks to remain so for the week. Celery is shipping out of Oxnard, Yuma and Coachella. Texas and Florida are harvesting celery and are not adversely affecting the market on California and Arizona product. The quality of celery is nice with color ranging from medium to dark green, while weights on celery are lighter ranging between 50 and 60 pounds out of California. Strawberries: With Valentine’s Day Pull out of the way, shippers are still looking for a home for a lot fruit. This has helped to put some downward pressure on the market. Demand is moderate to light out of California, again causing the market to weaken. Quality is great. Demand is also light out of Florida with a weakening market. Quality is fair to good. Raspberries/Blackberries: Raspberry supplies are limited. Demand is very good and the market is active. Quality is good. Blackberry supplies are very limited. Market is active. Quality is good with a few fair lots. Blueberries: Market is steady. We could see the market start to firm up as the week moves on due to good movement. Quality is great out of both L.A. and Miami. With Temperatures returning to 30 degrees plus, packing sheds can return to full schedules and transfer from storage to pack should not be an issue. This is helping to steady the market this week. Burbanks are dominating the pack out, as Norkotahs continue to dwindle, and sizing continues to the smaller side. Norkotahs will finish up in Idaho in the next couple of weeks, which will put the large size product in even shorter supply. Western states are in good supply on big potatoes. Washington and Colorado have excellent supplies of Norkotahs and are peaking to the larger sizes. Deals can be made on straight load volume 50ct and larger from Washington and Nevada currently has good supplies of large size Burbanks. The colored potato market remains steady. New crop California colored potatoes are going strong with excellent quality supplies. Mount Vernon, WA product is still available with very good quality and supplies. There are still supplies coming out of North Dakota on all colors as well. The Idaho yellow onions continue with very good supply and excellent quality. The market was mostly steady this week, but there were also a few dips on Jumbo yellows. Very little export demand continues to keep this market down in the cellar. Some shippers are even saying they are not covering cost of growing the onions. There are deals to be made on load volume jumbo and larger sizing. Red onions inventories are starting to tighten just a bit, but good quality. Washington has good supplies of all colors. White onions are continuing to see some activity with light supplies but light demand as well. Mexican white onions have started with light supplies loading out of Texas. New crop Mexican yellow onions are now available, with light supplies. Reds will follow a few weeks later. Poor weather has caused trucking nightmares that have just begun to clear up. Smaller-sized fruit continues to tighten at a faster rate than larger sizes and demand just does not want to back off at all. FOB’s on Reds and Golds are mostly stable while Granny have firmed once again since the prior week. WA Pear markets are stable; supplies and quality are both good on Anjou and Bosc. 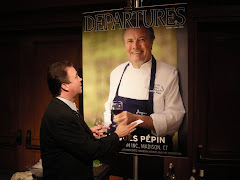 Anjou should last at least through the middle of summer and Bosc should remain available through March. Bartletts will re-start in August. Available volume has tightened further with prorates increasing to around 20% of cases ordered. Market fruit is scarce; FOB’s are high and firm but have stabilized for the most part. Quality remains good. Soft demand and ample supplies have caused Stone Fruit markets to weaken; quality is good to excellent. Pineapple volume is a little tight but demand is a little sluggish—markets are currently steady. Within the next week or two we expect demand to begin to exceed available supplies and continue this way through the Easter holiday that comes early this year (March 23). Quality is good. Post Super Bowl demand is just beginning to pick back up. Although CA harvest volume is beginning to improve, production remains on the tight side to allow fruit to size up. Available sizing is still skewing on 60’s and smaller. Supplies should be much improved within the next month and even better within the next two. Markets are stable. Oil content is decent but not optimal and is still improving. Checkerboarding is going away and shelf life is good. Chilean pricing is steady to slightly down. For the most part, this deal will wrap up by the end of the month. One last small arrival is due in next week. Remaining sizing is skewing smaller. Both quality and shelf life remain good. Mexican FOB’s are also steady to slightly down. Oil content is very good. Volume crossing the border has fallen to help maintain favorable markets. Markets are steady to slightly stronger as Standard and XL supplies have tightened on solid demand. Quality is good to very good with some minor curving still being noted. Recent growing conditions in Mexico have been very good with temps expected to cool slightly over the next few days. According to The Produce News, CA supplies should be good for Easter that is falling especially early this year on March 23. Also, very light production has already begun in the Imperial Valley and may start as early as later this month for other CA growing areas. There are no significant changes to the Grapefruit markets. There are good supplies available in a range of sizes. The end of March will bring tighter supplies and firmer pricing. Solid demand is burning through Pineapple Juice Orange supplies and causing prices to rise. By the last week of the month, we expect the Pine deal to be wrapped up and for the Valencia deal to have started at FOB’s higher than current pricing. Honey Tangerine supplies far exceed demand and the market continues to crash. Quality is solid: exterior appearance is fair to good; brix levels are high; and, overall eating quality is very good. Navel markets remain steady and availability remains plentiful. Korean exports are solid and on the increase. Fruit is peaking on 88’s & 72’s followed by teens & 56’s. Brix, color, and overall quality are all good. Recent cooler weather will improve shelf life. Lemon pricing is stable to slightly firmer and markets remain very strong partially due to solid demand. D1 harvests remain somewhat limited. 165’s and 200’s remain the tightest sizes. Some lingering, limited Mexican fruit remains available but quality is reportedly very poor. Chilean fruit will become available again in May. Lime volume crossing the border is limited; tight supplies and healthy demand are causing firmer markets. Although there is reportedly some wind and thripp scarring, color and overall quality are good. Available supplies now far exceed demand causing further market declines that have now stabilized for awhile. Pricing is predicated on sizing. There are deals to be made on smaller fruit but care is needed to ensure product is not old. Flame markets are stronger than Green Seedless that continue to weaken due to enhanced volumes. Larger-sized Flames are commanding stronger prices. Harvesting should wrap up within the next 10 days that will then transition to Ruby and Crimson. Thompson & Sugarone FOB’s have stabilized. Compared to Flames, there is much better availability on larger-sized Thompsons. Berries have a good exterior finish and eat well. Cantaloupe pricing is softer. Demand is on the weak side. Quality is fair to good; immaturity, softness, and sunken areas have all been issues. Spring harvests in Guatemala start up this weekend and will lead to better availability on 9’s and 12’s. Honeydew markets are easing. Honduran volume is good. Overall off-shore quality is very good. Watermelon markets are soft, especially on smaller fruit. Demand is only fair on Seedless and weaker on Seeded. Good growing conditions in southern Mexico have produced good volume and quality. Markets are mostly steady and should remain this way for the next 7-10 days. There are plenty of supplies; demand is not overabundant but it is sufficient to move containers. Super floor inventories are cleaning up on a daily basis; there are plentiful amounts of Selects. Color and overall quality are very good. Although production is steady, we expect to see fewer Supers and more off-grades by the weekend. Markets may firm by next week due to lower projected volumes. Demand is only fair. Currently, there is no firm date when Baja will get started and alleviate some price pressure. Quality is good to excellent. Markets are strong; they may firm by the beginning of next week due to limited harvesting and tighter supplies. Larges and Mediums will have the best availability by the weekend; Jumbo’s, XL’s, and Choppers will all be tighter. Demand is decent but not the greatest and although some issues are being reported, quality is generally good. Ample volume is expected for the next 7-10 days. However, within the next two weeks, fields will be on the backside of production volume. There are deals to be made based on size. Quality is good to excellent. The projected downturn in volume is holding true. Cooler temps and growers picking product green to take advantage of market conditions have tightened supplies and firmed pricing. And, this scenario is expected to linger for at least the next two-week period. Although some new acreage is expected to break by month’s end, some older acreage will be playing out by the middle of next month. Better-quality labels are easily selling out fairly quickly. Plentiful volume brought on by warmer temps has eased FOB’s. Both Yellow and Zuke markets are relatively cheap but fairly steady. Boca received some rain yesterday and there is the possibility of some bad storms over the weekend accompanied by strong winds that could turn the current supply scenario upside down. Yellow supplies are decent but are far less than currently available Zuke supplies. Yellow markets are firm and stable while Zukes are at lower levels with plentiful supplies expected for the next 10-14 days. Quality is good to excellent and expected to remain this way as product continues to be harvested from newer fields. Volume on both should improve by month’s end as growers enter new fields. Overall supplies will generally be tighter over the next 3-4 weeks, but Mexican production should be able to cover demand that is still not stellar. FL volume continues to dwindle which will pressure the western deal; eastern markets will be predicated on western activity and conditions. With the exception of some hit and miss issues with Romas, overall quality is good, especially out of Nogales. In the east, markets are steady to slightly softer. Cherry FOB’s are the most stable. Grape pricing is most likely on the floor now. Some packing houses are completely done for the next month until spring production takes off. Homestead production is expected to slow down but not stop—bloom drop affects will be felt within the next 7-10 days. Immokalee/Naples will gap because it was affected more by past freezing temps and volume out of this area is now not expected to improve until late next month. In the west, there is some softer pricing on Mature Greens, Grapes, and Cherries; Vine Ripes & Romas are both slightly firmer. Mature Green volume will begin to decline within the next month. A week ago, there were a lot of Vine Ripes with a lot of color that had to be moved through the supply chain at cheaper pricing; although pricing has rebounded, it will most likely remain fairly stable over the next couple of weeks. Roma pricing is currently being defined by quality—better quality will definitely cost more. Reportedly, there is one Baja grower about to break new Grape fields. Natural Selection Foods LLC, San Juan Bautista, Calif., plans to phase out its growing and processing of conventional fresh produce as soon as this spring, and will emphasize marketing under the Earthbound Farm brand as the company’s two processing facilities convert to organic. He said as the company’s two facilities, in San Juan Bautista and Yuma, Ariz., shift to organic, the volume of conventional product will be replaced by organic and there will be no reduction in overall volume. He said the organic category has grown steadily by 15% to 20% for a number of years. - University of California Sustainable Agriculture Research and Education Program. At Petaluma Poultry, a pioneer and leader in the organic foods industry, they are dedicated to farming practices that renew natural and human resources. Their goal is to produce the finest poultry products while reducing waste, preserving the environment, supporting their employees' comfort and efficiency, and contributing to the local community. Dedicated to farming practices that renew natural and human resources, they manage their ranches with great care to preserve the land, air and water. They grow their chickens in roomy, naturally lit barns, allowing Rocky the Range chicken and Rosie the Organic Chicken access to the outdoors. Their chicken feed, based on corn and soy, is free of animal by-products, animal fats and antibiotics; Rosie’s feed is 100% certified organic. As part of the company’s extensive recycling program, they send chicken manure to rice farmers who, in turn, provide them hulls to spread over the earthen floors of their poultry houses. Representatives from the hatchery, mill, farms and processing plant belong to the company’s Sustainability Team and lead their concerted effort to produce the finest poultry product while reducing waste and minimizing the use of natural resources. At Willowbrook Mill they voluntarily avoid using electricity during peak hours – noon to six, Monday through Friday. their packing boxes are recyclable, sealed with environmentally friendly adhesive. 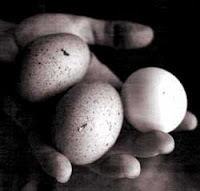 The hatchery donates cardboard egg flats to a rancher who raises crickets. In the processing plant they continually modify and improve their technology with the goal of improving employee comfort and efficiency. Their safety record is one of the best in the industry. In 2001 they participated in a cutting edge, scientific experiment using ozone as a sanitizing agent is the processing plant. Ozone has the remarkable potential of eliminating the use of chlorine in our plant and reducing by 85% the use of water. 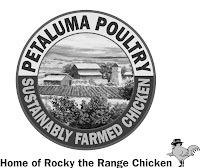 Petaluma Poultry recognizes the long term interdependence of profitability, eco-efficiency and social responsibility. They are an established, successful family business that cares for the working and living conditions of their employees. Workers receive a complete compensation package including competitive wages, full health/dental/vision coverage, life insurance and a 401-K program. Employee turnover is very low; many have worked with them for decades. By virtue of their pioneering efforts in organic poultry production, Petaluma Poultry is a leader in the organic foods industry. In this role they are constantly working to improve the laws and regulations that govern organic production. The company contributes time and resources to groups such as California Alliance with Family Farms, the Organic Trade Association and the Organic Farming Research Foundation. At Petaluma Poultry they support farming and business practices that nourish the environment, the community and the individual. They are active supporters of a variety of local charities, including the performing arts, the Boys & Girls Club and the local food bank. Above all, they have an abiding respect for the agricultural roots of Sonoma County. Sustainable, diversified farming is Sonoma County’s future. What Is This CONJUGATED LINOLEIC ACID (CLA) Anyway? Beyond obvious vitamin and mineral properties, recent evidence shows that foods that have been around for millenia have other factors that improve health. Tomatoes contain lycopene, grapes have anthocyanins, and broccoli features cancer-fighting sulfides. For at least a decade scientists have known that conjugated linoleic acid found in ruminant animals contains one of the most potent anti-carcinogens ever discovered, according to Lance Baumgard, UA animal scientist. We at U.S. Foodservice™ created the Foodservice Advantage Club™ to help you, a valued U.S. Foodservice™ customer, save money, streamline your operations and increase revenue. The Foodservice Advantage Club™ provides access to premium services and time saving management tools. There is no membership fee. Start taking advantage of the club today! Foodservice Advantage Club™ members have access to over 100 management tools to make managing their business easier. Tools include everything from standardized forms to sales and training resources. The Marina City Council on Tuesday February 5th will consider whether to draw up an ordinance that would ban Styrofoam packaging in restaurants. Mayor Ila Mettee-McCutchon will lead a discussion of her proposal to eliminate plastic foam food and beverage containers, and the council will then determine if it wants to study the matter further. Going Green link for more info about green products. Jim Crane from SNR will be in town Wednesday February 27th Snake River Farms American Style Kobe Beef & Kurobuta Pork cutting product and answering questions. On February 28th the representative from Heartland Beef will be in town with samples of Akaushi Beef. Thats right an American raised, Japanese breed of cattle that regularly grades three times higher than prime, yet is low in saturated fat! Email now with the product you would like to cook up against these products, and the best time to see you on the 27th for Snake River Farms, and the 28th for Akaushi Beef. Texas Akaushi cattle are 100 percent pure and are direct descendants of the Mount Aso region's revered Akaushi herds that are a National Treasure and protected breed by the government of Japan. HeartBrand Beef Incorporated has respected the deep Japanese traditions and embraced the healthy results of source-verified herd management in a natural environment. HeartBrand Beef has developed and implemented a comprehensive vertically integrated quality control and natural production system from conception to consumption that excludes the use of growth hormones. Akaushi cattle in our program are managed with minimum stress and treated in accordance to the USDA Humane Handling Standards and Guidelines. What's so unique about Akaushi cattle? 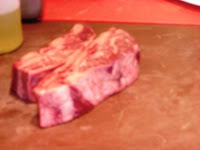 Akaushi cattle produce meat that has a high amount of intramuscular fat – commonly known as marbling. It is healthier due to its unique fatty acid composition when compared to other domestic beef . Akaushi meat is very tender, juicy and flavorful and it is consider by the Japanese and many beef experts to be the most palatable, and yet healthy, beef in the world. These attributes make Akaushi beef more desirable to western consumers than other U.S. meat. A rancher in Texas has grown the largest group of purebred Akaushi cattle outside of Japan. Japanese cattle, which come in red and black varieties, are a closely guarded national treasure. Their beef, often called "Kobe beef" by American restaurants, commands staggering prices but is heralded by chefs and gourmands for thoroughly marbled fat that gives the meat tenderness and rich flavor. On a quality scale of zero to 12 used to rate beef in Japan, where heavy fat marbling is preferred, Kobe rates a minimum nine points and Angus beef 4.5; Calles' animals rate around 7.5 to 8.5. Through careful breeding and with the help of surrogate cows, Jose Calles' tiny herd of 11 has grown to 5,000. "The cattle are a national treasure in Japan," says Catherine O'Gorman, senior vice-president of marketing for Heart Brand Beef. "Through a legal loophole, the cattle were allowed out of the country in 1994." But after public outcry in Japan over the breed's export, the loophole was closed and exports ceased, she says. Since then, Heart Brand Beef says it has maintained the purity of its Akaushi herd, allowing no crossbreeding (unlike some domestic Kobe that have been bred with Angus). The company has good reason to keep the breed pure: Akaushi beef is renowned for its quality. Its intense marbling surpasses the benchmark set by the USDA for prime designation, the grade typically served in high-end steakhouses. Ms. O'Gorman says that although Akaushi beef is guaranteed to be "prime plus," the majority of the product grades at two to three levels higher. Last week unusual and persistent cold temperatures lingered in the desert lettuce growing regions, slowing growth. In addition, cooler daytime temps, and morning ice, had helped to keep supplies light. Fortunately demand has been low also, helping to keep the market in check. Most suppliers are now reporting good supplies available. Quality reports identify epidermal peel and leaf blister in nearly all lots and labels. We still may see lighter weights, pale color and smaller head sizes as issues. Cool weather again will hit the Yuma area beginning Feb 3, holding day time high tempts to mid 60’s. 25 % chance of rain on Sunday. With any increase in demand, or difficulty in harvesting, we could see potentially higher prices heading into early February. Weights are running 44 – 50 lbs per case. Florida is experiencing fair to good supplies with demand and supplies expected to being steady. Weights reported in the 38 – 44 lbs per case range. Ten day forecast calls for weather with daytime highs of 80+, but with a chance of showers off and on all week. Mexican supplies of iceberg are steady. Once again desert Romaine, green leaf and red leaf lettuce are in a similar situation as Iceberg. Romaine does have some challenges that include growth, cupping, and peel as quality issues. The fact that prices have eased over the past two weeks can be attributed to ample acreage under production. Florida romaine is seeing improving quality with the cooler weather. Supplies are quoted as good and expected to be steady. Weights are in the 38 – 42 lbs range. Despite light demand for broccoli, desert production is even lighter. The persistent cool temperatures are expected to continue at least through Feb. 5, which will prolong the stretch of light supplies. Buyers can expect continuing expensive prices well into early February. Florida supplies are available and there are very heavy supplies available from Mexico right now. Supplies are light, but so is demand keeping this market in check. There have been some reports of rain causing spotting and mold issues. Supplies from Mexico are very light at this time. The celery market has slipped just a bit this week and supplies are steady. Larger sized supplies on celery are heavier now, but shippers are said to be dealing on all sizes to keep product moving. Demand looks to remain good through the week. Celery is shipping out of Oxnard, Yuma and Coachella. Texas and Florida are supplying the east coast. Strawberry growing areas in California received 1” of rain Saturday and Sunday in addition to the 3” to 4” they received over last week. Most shippers are stripping their fields with a few trying to pick and strip at the same time. Volumes that will be harvested for the fresh market will be low and kept close to the West coast due to quality. Most of the large fruit and ripe fruit will be stripped off the plants. This will have a major affect on Long stem strawberries for the Valentine’s Day pull. Production this week will be reduced by a minimum of 35%. The forecast is for mild/cool weather for the balance of the week, which will not help the ramp up for next week loading for Valentine’s Day pull. There is a chance of more rain again this weekend. Market is firm. Quality is fair at best. Florida strawberry growers are slowly recovering from the wet cool weather they have had over the last week. Harvest numbers are still light with the quality slowly improving. Market is firm. Cool weather in both Florida and California is also not helping the growers. This is causing a demand exceeds supplies situation. Harvest is going to be very light out of Florida and California for the next 10 days. Strawberry supplies for the upcoming Valentine’s Day pull looks to be limited. Plenty of Mexican berries available. Raspberry supplies from Chile and domestically look to very limited for the next 10 days due to a natural down cycle. Demand is very good. Market is very active. Quality is good. Chilean and Mexican Blackberry supplies are also in a natural down cycle and will limited for the next 10 days. Market is active. Quality is good with a few fair lots. Market is steady. We could see the market start to firm up as the week moves on due to good movement. Quality is great out of Chile. Temperatures have warmed up a bit but the wind chill factor is still causing havoc on pack out numbers. A very short window of time to transfer potatoes from storage to packing exist before potatoes freeze, this can happen at 20 degrees within a 10 mile trip, and this is putting a severe strain on available cartons. Burbanks are dominating the pack out, as Norkotahs continue to dwindle, and sizing continues to the smaller side. Norkotahs will finish up in Idaho in the next couple of weeks, which will put the large size product in even shorter supply. Western’s are in good supply on big potatoes. Washington and Colorado have excellent supplies of Norkotahs and are peaking to the larger sizes. Deals can be made on straight load volume 50ct and larger from Washington and Nevada currently has good supplies of large size Burbanks. The colored potato market remains steady. New crop California colored potatoes are going strong with excellent quality supplies. Mount Vernon, WA product is still available with very good quality and supplies. There are still good supplies coming out of North Dakota on all colors as well. Cold temperatures continue to have an impact on supplies and prices in Idaho. The Idaho yellow onions continue with very good supply and excellent quality. Very little export demand continues to keep this market down in the cellar. Some shippers are even saying they are not covering cost of growing onions. There are deals to be made on load volume jumbo and larger sizing. Red onions are holding steady with lighter supplies and good quality. Washington has good supplies of all colors. White onions are continuing to see some activity with light supplies but light demand as well. Mexican white onions have started with light supplies loading out of Texas. New crop Mexican yellow are set to start within the next 2 weeks in February with light supplies. Reds will follow a few weeks later. Demand remains as strong as ever, especially on Reds, Granny Smith, and Galas. Red Delicious pricing continues to firm and Granny Smith remain extremely tight. Pear demand is solid with an increased interest on smaller-sized Anjous. There is some poor weather in WA State that has impacted the trucking scene and will most likely cause delayed deliveries. Contract needs are being met but shippers are holding buyers to weekly averages and there is very little excess market fruit available. A lot of fruit is delivering more green than usual as shippers and ripeners try to catch up to demand and push fruit through the supply chain. We expect this tight scenario to last for the next 3-4 weeks. Overall quality is good. Chilean stone fruit supplies continue to gather strength and weaker demand has led to softer markets. Overall quality is good to very good. Pineapples are now tight on all sizes and significantly improved availability is not expected until the end of February. What availability there is is now shifting to larger counts. The excess supply of 8’s that existed over the past couple of weeks is totally gone. Quality is still good. The Super Bowl pull is basically over. CA rains have significantly impacted harvesting, inventories are light, and FOB’s are steady. There is better availability on larger-sized Mexican fruit and Chilean volume continues to dwindle. Regarding quality, CA is good to excellent, Chilean is ripening evenly, and Mexican shelf life is still not optimal once fruit is ripened. Due to much improved Mexican-sourced supplies, west coast markets have dropped but should stabilize by the end of the week. With the exception of some possible strengthening for Valentine’s, we expect markets to remain fairly stable. At best, current demand is just fair. Grapefruit markets this week are steady with firm prices. Quality is good and the best availability is on 36’s and 40’s. The Juice market is firm on 100’s and 125’s due to limited volumes. Any excess supply from last week has dried up; quality is good. Honey Tangerine markets are softer this week and will probably bottom out by the weekend; quality is good. CA Navel markets are steady. Recent rain is cleaning up any excess floor inventories. Significant rainfall can lead to puff and crease and clear rot. Color is very good and eating quality is excellent. Lemon markets remain strong and smaller fruit continues to be extremely tight. Overall quality is good. Lime markets also remain strong but should ease shortly; the best availability is on 200’s and quality is good. Seedless markets have eased on still-improving volumes and slower movement. Berry sizes are still skewing on the small to medium side. Quality remains fair to good. Cantaloupe markets are strong as we are in a demand exceeds situation. Import volume should improve over the next month with significant increases expected in March and April. Quality is variable but should stabilize shortly. Honeydew markets are stable but firm due to tight import supplies. Demand is beginning to show signs of weakening due to high prices. Quality is good to very good. Watermelon markets are fairly strong due to decent demand and limited supplies caused by wet and cooler weather in Mexican growing areas. Due to much improved off-shore volume and slightly lower demand, markets are down compared to last week. Quality is consistently good to very good. Expect Nogales markets to be on the weaker side for the next 7-10 days due to generally good availability. However, total volume may begin to tighten back up next week. Quality is good to excellent. Markets have strengthened due to good demand and inconsistent volume & quality caused by freezing temps at the beginning of the month and significant rainfall at the end of last week. Quality is now fair at best with bruising an issue. Choppers are currently on the tight side. Many growers and shippers are taking a “wait & see” attitude regarding availability and markets. We expect lighter volume over the next 7-10 day period mainly due to cooler temps. Because there is less production on both coasts, markets are firm, but steady. Quality is good to excellent. Current Nogales supplies are decent but are on the decline. Compared to volume over the past two weeks, some major growers are now down 30-40% in production. Quality is wide ranging from fair to very good. Yellow markets are somewhat more stable than Zuke markets that have strengthened. Mediums are currently much harder to find than Fancy. Quality is mostly fair to somewhat good. Yellow sourced out of Homestead and most of Immokalee has decent quality but there are issues with product sourced out of some areas of Immokalee and Clewiston with scarring and even some decay. Zukes are in lighter supply and Yellow will follow the same path within the next 7-10 days due to a bloom drop at the beginning of the year. Anticipate stronger markets by the weekend. Quality is ranging from fair to very good. Overall FL production volume continues to decline with the exception of Grapes. The full impact of the bloom drop caused by the freeze earlier in the month will be felt within the next couple of weeks and overall volumes will be tight until around mid March when Immokalee and Naples begin their spring crops. Mature Greens in the east are slightly stronger as FL volume dwindles and Puerto Rican supplies can not significantly impact the overall market. Western Mature Green supplies are also tight causing buyers to switch to much more readily available Vine Ripes. In the east, smaller sized Rounds will be more expensive than larger sizes. Roma markets are steady to slightly easing in the west but stronger in the east where availability is limited, especially on larger sizes. Grape markets are steady but have weaker undertones, especially out west where there is some variable quality. Cherry markets on both coasts are fairly stable. SF Beer week is kicking off this weekend with events running from the 6th-15th (Yeah, I counted 10 days in that week) it will feature beer events from "The City" down into the South Bay and Monterey.